Years ago I went to an Eskrima workshop that was offered at the karate school that I was attending at the time. Eskrima is a Filipino martial art that employs the use of rattan sticks (among other weapons) of various length, similar to the Japanese jo. Eskrima calls for a pair of sticks to be used in unison (at least as what I had been shown on this day). The strikes, parries, blocks and counters of the style knows no bounds. For sure, any type of weapons training will end things quickly in the real world. For the uninitiated, one hard whack on the knuckles from these things and it's game over. In the late 80s, students of Dan Inosanto (a master Eskrimador and former disciple of Bruce Lee) developed the Dog Brothers style of full-contact weapons fighting. Practitioners use little or next-to-no protective gear for single and double-stick sparring, but also mock knifework and even chain whipping that combines standup hand-to-hand fighting and ground game similar to MMA complete with tapouts. Matches are often brutal and bloody preceded by the caveat that "there isn’t any suing each other...no one spends the night in the hospital" and at the end of the day "we’re friends." The credo of the Dog Brothers system, "The greater the dichotomy, the profounder the transformation. Higher Consciousness through Harder Contact," refers to the centering of awareness despite the intense adrenaline rush and pain experienced during a real fight. It is with the hope that the practitioner's lessons "carries over to the rest of one’s life; and should one ever need to use one’s skills that it will be done with a calmness that allows for good judgement as well as good skill." [T]he UFC tournament has pushed the boundaries of what is acceptable in TV sports entertainment. The political foes that this event has attracted, because of the tournament, has made us acutely sensitive to what the limits are on North American television. So it is with great reluctance that I must tell you that stickfighting, such as your group has pioneered in the USA, is just too extreme for the UFC format at this time. We have the utmost respect for your group's skills and fighting spirit. Perhaps like the UFC, your type of fighting is just ahead of its time. In addition to the stick (30") a DB stylist should be able to handle himself proficiently with clubs, knives, staff (54"), improvised weapons and empty-handed techniques in all ranges and against multiple assailants. Like Filipino arts, empty-handed skills are learned after weapons training. The Dog Brothers martial arts are not for everyone says the group's guiding force, Marc 'Crafty Dog' Denny. 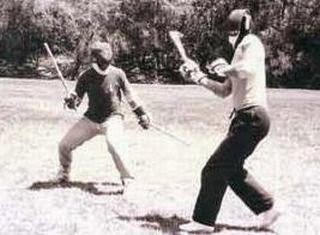 Players could fortify themselves with heavy protective gear, a la kendo, but that would be counterproductive. "The danger and risk are necessary to the transformitive nature of the experience."